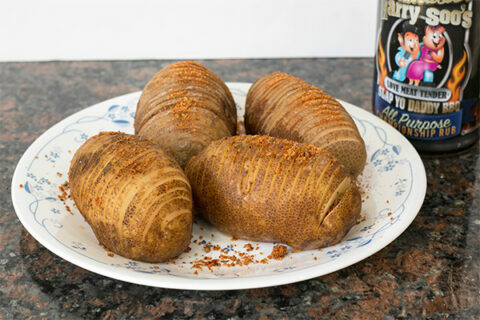 If you’ve never tried roasting potatoes in your smoker you’ll be pleasantly surprised that the flavor is better than doing it in the oven. This recipe for pit roasted Swedish Hasselback potatoes works well for a formal dinner or a backyard party. You can also cook this ahead and reheat when you arrive at your event (save the topping until before you serve). I sped up the cooking process by microwaving the potato first. I’ve also taken these to a tailgate and a camping trip and they were a huge hit. 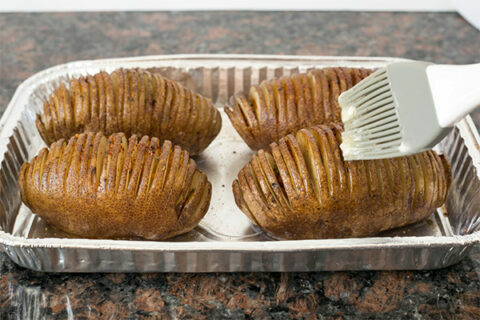 This method of preparing potatoes was invented in the 1950’s at the Hasselbacken Restaurant, now attached to a hotel in central Stockholm, Sweden. The hotel was established in the 1700s as an inn and was originally a traditional red hut in the midst of a hazelnut trees, which is how it got its name. Restaurant Hasselbacken opened in 1853 in a grand new building and Hasselbackspotatis were first served in the 1950s and were an instant hit and have become popular all over the world. It looks intricate with its accordion pleats fanning out as you cook it and is easy to make. 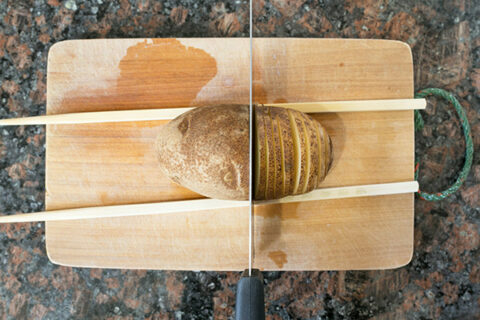 All you need is to place two wooden cooking spoons next to your potato and a sharp knife to cut down ¾ way until the spoon handles stop the knife. 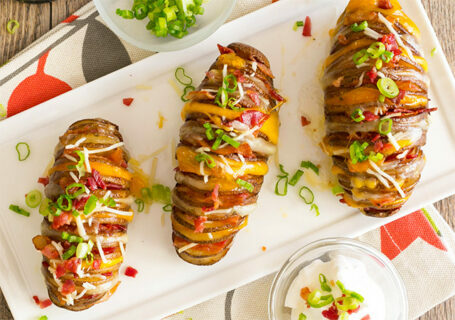 You can also dress it up many ways for a show-stopping presentation with Parmesan, bacon, Cheese Whiz, sour cream, chives, and pretty much anything that goes with a baked potato. Sprinkle a light coat of SYD rub all over the cut potatoes, place in glass bowl and microwave until the potatoes are tender but not dried out (it took about 8 minutes, on baked potato setting, in my Sharp microwave). Place in a disposable foil pan and brush liberally with the melted butter. 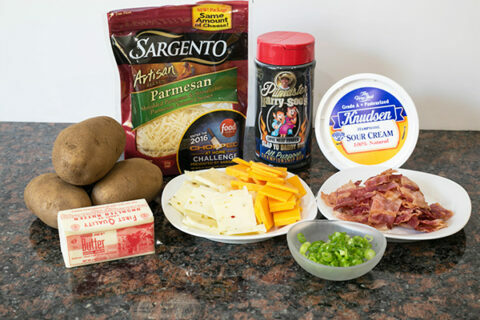 This looks like a great side dish! 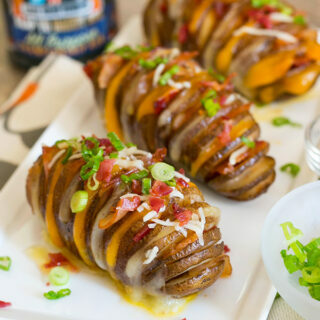 One thing I like to do is bake my potatoes outdoors separately in one of the small Weber Smokey Joe grills, for about 45 minutes, using Kingsford blue briquettes and a big chunk of apple wood–it gives a great flavor to the potatoes. (I pile the coals off to one side so I can fit maybe six medium potatoes over to the side for indirect heat.) 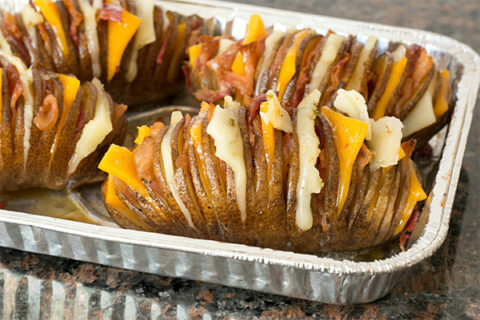 I may try this recipe, pulling the potatoes off the grill a little early for slicing (so they are not too soft), then finish them up on the Smokey Joe.